Our Foolish contributors think these six top stocks are worth buying to kick off the new year. With President-elect Trump set to take office in a few short weeks and the Federal Reserve expected to introduce multiple rate hikes that should strengthen the greenback against many foreign currencies, this year promises to be a particularly interesting -- and perhaps challenging -- one from an investing standpoint. Keeping this theme of a rapidly evolving marketplace firmly in mind, our contributors think that AbbVie (NYSE:ABBV), PayPal Holdings (NASDAQ:PYPL), Winnebago Industries (NYSE:WGO), BOFI Holdings (NYSE:AX), Sunoco Logistics Partners (NYSE:SXL), and Sherwin-Williams Co. (NYSE:SHW) could all turn out to be top stocks in 2017. Read on to find out why. George Budwell (AbbVie): Despite its top-selling anti-inflammatory drug Humira going off patent in the U.S. last month, AbbVie's shares still managed to end the year on a high note, rallying by 8.7% for the full year. That's an encouraging sign that the market may indeed be willing to look past both the uncertainty over AbbVie's ability to defend Humira's market share for the foreseeable future, and management's rather liberal use of debt-financing to broaden the drugmaker's product portfolio and clinical pipeline over the past year. Why is the market warming up to AbbVie right now? The reasons are twofold. First off, AbbVie has continued to earn its stripes as a dividend aristocrat by raising its payout like clockwork, resulting in a top flight yield of 4% at current levels. Secondly, this drugmaker has never failed to deliver industry-leading levels of top line growth since becoming an independent entity in 2013. This year, for example, AbbVie's top line is forecast to grow by nearly 10%, thanks in part to new product launches and label expansions for key growth drivers like the blood cancer drug Imbruvica. In all, AbbVie appears primed to continue its upward trend this month, and should turn in another strong year in 2017. Steve Symington (PayPal Holdings): Shares of PayPal jumped more than 10% the day after its latest quarterly report in late October, and with good reason. Quarterly revenue climbed 21% year over year on a constant-currency basis to $2.67 billion -- slightly better than Wall Street had hoped -- driven by a 25% increase in total payment volume and 24% growth in total transactions processed. PayPal also increased its active customer accounts 11% to 192 million, while payments per active account jumped 13%. On the bottom line, PayPal grew adjusted net income 13%, to $425 million, while adjusted net income per share grew 14% to $0.35, or roughly in line with expectations. But most encouraging was the fact Paypal also told investors it expects adjusted operating margin to be stable or higher over the next three years. This helps to allay fears that its recently expanded partnerships with both MasterCard (NYSE:MA) and Visa (NYSE:V) -- which will both yield financial volume incentives for the company and significantly expand its point-of-sale presence to millions of contactless-enabled merchant locations around the world -- might negatively affect its margin profile past the short term. So with PayPal stock having all but given up its post-earnings pop, I think this is a great opportunity for long-term investors to consider opening or adding to a position this January. Dan Caplinger (Winnebago Industries): Most investors wouldn't think of the market for recreational vehicles as having particularly strong growth prospects, but lately the RV market has been extremely strong. A host of younger buyers have flocked to Winnebago Industries and other sellers of RVs, focusing on smaller entry-level motorhomes, travel trailers, and other towable products to help them enjoy vacations in a more familiar environment without having to pay the rising costs of hotels and other accommodations. Winnebago in particular has gone through a transformation lately. Its acquisition of Grand Design helped increase its presence in the towable RV market, and organic growth has also been extremely strong as the company increases its internal efficiency and takes advantage of greater demand. Backlogs have been strong, and despite rising competition from other players in the industry, Winnebago's name recognition gives it some advantages over its rivals that it aims to capitalize on in 2017 and beyond. For a stock with growth opportunities, Winnebago stock is relatively inexpensive, with an earnings multiple of less than 20. If things continue to go as well in the recreational vehicle industry as they have lately, then Winnebago should be a big winner in seeing its fundamental business keep growing at a healthy and accelerating pace over the next year. Jamal Carnette, CFA (BOFI Holdings): Although I loathe to play politics with my portfolio, in the event there are tangible, clear benefits to a well-run company I find it foolish (small f) not to incorporate this into your investment thesis. While President-elect Donald Trump made a routine of bashing banks in the Republican primary, after winning the nomination he's been decidedly less truculent; and post-election he's been outright bullish on banks, bringing on many Wall Street veterans for his cabinet. While BOFI benefits from a repeal of Dodd Frank directly in the form of lower compliance costs, the bigger effects appear indirect as investors become more bullish on banks as regulations are scaled back and valuations increase across the board. 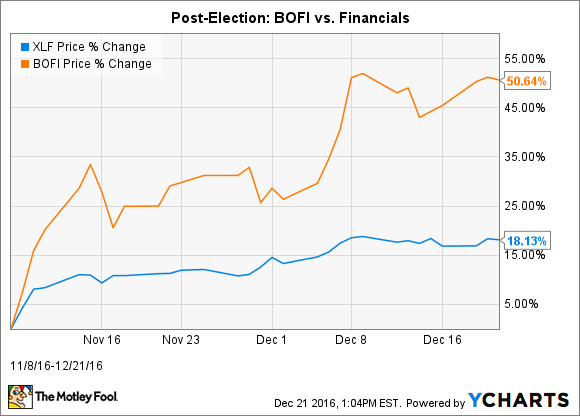 However, the biggest boost to BOFI's fortunes will be macroeconomic. In response to Donald Trump's proposed policies, the yield curve has become drastically steeper, particularly at the key five and seven year maturities. Considering the business model of a traditional bank is to pay interest at the lower end of the yield curve and lend at longer maturities, a steepening yield curve should lead to earnings expansion. Data source: US Department of the Treasury. Figures in percentage. Of course, Bank of Internet is not without risks. For one, the company trades at a price to tangible book value of 2.5 times, rather expensive versus competitors like Wells Fargo with a valuation of 1.9 times. However, the non-conventional model of eschewing branches allows the company to grow its deposit base by offering higher rates to consumers. Look for the company to continue to grow deposits and benefit from decreased regulation and a steepening yield curve. Matt DiLallo (Sunoco Logistics Partners): Oil pipeline MLP Sunoco Logistics Partners is on the cusp of a dramatic transformation. The company recently sealed a deal to merge with natural gas pipeline sibling Energy Transfer Partners (NYSE:ETP) in a transaction that will create a diversified energy infrastructure giant. The deal will expand Sunoco's strategic footprint, diversify its asset base, and integrate its complementary portfolio. Meanwhile, the merger will significantly strengthen Energy Transfer's financials and balance sheet. Finally, the transaction will lower costs through an expected $200 million in commercial synergies and cost savings. That transaction, however, is only one of the many catalysts on the horizon for Sunoco and Energy Transfer next year. The two companies expect to finally complete their controversial Dakota Access Pipeline shortly after Donald Trump takes office, which will enable them to start collecting cash flow from the $3.8 billion project. In addition to that, they have several other projects nearing completion as they put the finishing touches on a recent growth spurt fueled by more than $15 billion of expansion capital. As these projects come online, their steady fee-based cash flows should support double-digit distribution growth for the combined entity over the near-term. These initiatives put Sunoco Logistics in a position to have a big year in 2017. Because of that, January could be the best time to invest in Sunoco Logistics to capture these catalysts before they come to fruition. Neha Chamaria (Sherwin-Williams Co.): Sherwin-Williams might not appear cheap at 23 times trailing earnings, but there are valid reasons why the market is willing to pay a premium for the stock. The paint maker is on solid footing right now as it aims to take its enviable brand image a step further by merging with Valspar amid strong U.S. construction and housing markets. While the merger still awaits regulatory approval, the companies refuted regulatory setback rumors some days ago and expect to close the deal in the first quarter of 2017. As the merged entity will be the largest paint company in the world, its growth prospects are tremendous. Sherwin-Williams is building up its cash reserves to acquire Valspar, which is why it suspended share repurchases in 2016. However, the company continues to pay solid dividends, and I expect it to announce another hike within the next couple of months. Meanwhile, management is committed to boosting margins in 2017 by cutting operating expenses even as input costs pose a challenge. Prices of titanium dioxide (TiO2) -- a key pigment used in paints -- are rising, but Sherwin-Williams plans to pass on the costs by increasing paint prices in January. Higher prices and lower costs should boost Sherwin-Williams' margins further in 2017 even as it rides the strength in the housing markets. Overall, Sherwin-Williams is ending 2016 on a solid note from an operational and growth point of view, making it a must-watch stock for 2017.